An insulating material’s resistance to conductive heat flow is measured or rated in terms of its thermal resistance or R-value — the higher the R-value, the greater the insulating effectiveness. The R-value depends on the type of insulation, its thickness, and its density. When calculating the R-value of a multilayered installation, add the R-values of the individual layers. 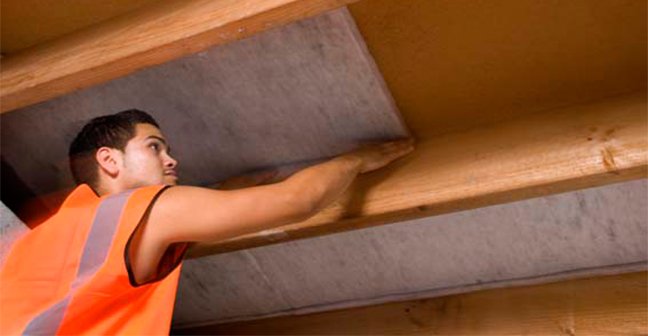 Installing more insulation in your home increases the R-value and the resistance to heat flow. To determine how much insulation you need for your climate, use an insulation calculator or consult a local insulation contractor. Insulation materials run the gamut from bulky fibre materials such as fiberglass, rock and slag wool, cellulose, and natural fibres to rigid foam boards to sleek foils. Bulky materials resist conductive and — to a lesser degree — convective heat flow in a building cavity. Rigid foam boards trap air or another gas to resist conductive heat flow. Highly reflective foils in radiant barriers and reflective insulation systems reflect radiant heat away from living spaces, making them particularly useful in cooling climates. Other less common materials such as cementations and phenolic foams and vermiculite and perlite are also available. • Properly installed insulation reduces heating and cooling costs by reducing heat losses and gains through a home’s building envelope. • The type and form of insulation you choose will depend on your climate, the R-value you hope to achieve, whether you are adding insulation to an existing home or building new, and whether you are hiring a professional or planning to do the job yourself.